On a wet March Monday, the Jallianwala Bagh complex is crowded. The narrow passage from where Brigadier General R.E.H. Dyer ordered firing is bubblegum pink. 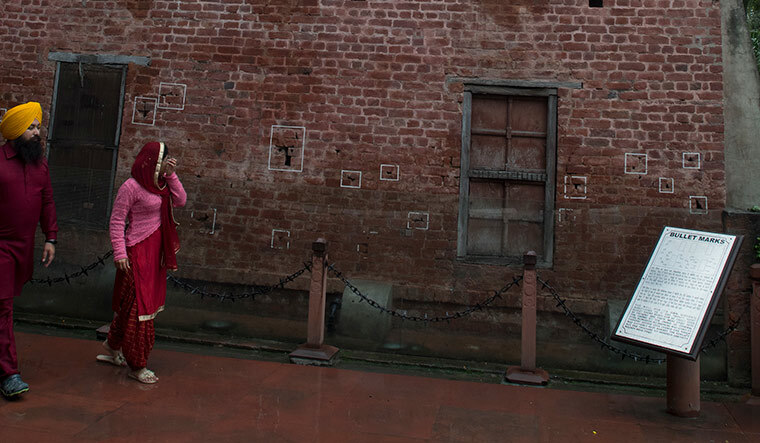 Women in their silk saris try to stem the rain with their scarves. Children run around. Selfie-crazed teenagers whip out their phones and smile, with the green expanse in the background. Families on an Amritsar darshan dutifully look at the bullet marks. The Eternal Flame flickers at the entrance. 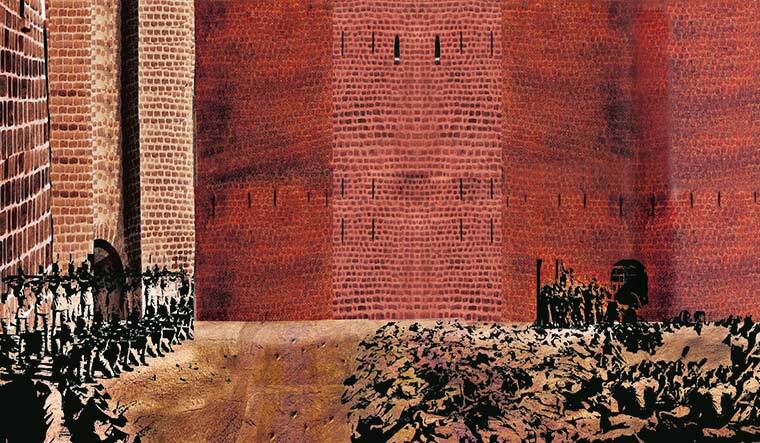 A century after the massacre, Jallianwala Bagh still has the power to evoke emotions. In Britain, the House of Lords sat up on February 19, apparently for the first time, to discuss the massacre and the need for Britain to apologise. But, this demand for an apology is not new. The British queen’s visit to the site in 1999 and prime minister David Cameron’s visit in 2013 had seen the demand going high-pitched. 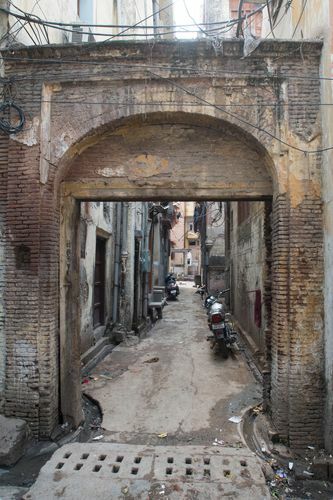 Closer home, the site and the Jallianwala Bagh Memorial Trust—the board that manages the site—have become a battleground for petty politics between the BJP and the Congress. The BJP, with its sheer majority, passed a bill in the Lok Sabha on February 13 to remove the permanent membership of the Congress president in the Trust. This move had prompted the Congress to accuse the government of “erasing history”. Jallianwala Bagh’s legacy and the efforts to control it will continue in the days to come. Winston Churchill, the British secretary of war during 1919-1920, referred to the massacre as “a monstrous event... without precedent or parallel in the modern history of the empire”. But, Churchill maintained that it was an anomaly—Dyer was evil, not the empire. For India, the massacre changed its national narrative. The ugly face of the empire got exposed. Rabindranath Tagore returned his knighthood, M.K. Gandhi embarked on his path to launch the noncooperation movement, and Bhagat Singh and Udham Singh embraced their respective paths of revolution. Udham Singh, who vowed revenge, waited for 21 years and killed lieutenant governor Michael O’Dwyer, who was at the helm of affairs in Punjab during the massacre. It also marked the beginning of women coming out to support the cause of independence. The massacre changed Punjab, too. The state had sent the most troops to the British war efforts in World War I. The stories of forced recruitment of troops from the state were overshadowed by the stories of valour. A century later, the massacre is remembered only as an event. The lead-up to the event, as well as the brutality that followed with the British imposing martial law, has vanished from public memory completely, even in Punjab. In its mythification, the massacre appears like an isolated incident. But, it happened in a period when discontent against the British had been brewing steadily. In 1919, Punjab was a tinderbox. There were thousands of troops who had returned home from the war front. There were no jobs. Land grants were given only to those who had gallantry medals. “There was an outbreak of Spanish influenza. There was price rise and then there was the Rowlatt Act,” says Amandeep Bal, head of the history department, Guru Nanak Dev University, Amritsar. The “draconian piece of legislation”—in the words of Justin Rowlatt, the great-grandson of Sydney Rowlatt, architect of the namesake Act—was to brutally stamp out sedition. The press was controlled, people could be arrested without warning and held without trial. It ensured that a state of emergency remained in force, even during peace time. Amritsar was among the main centres of the anti-Rowlatt protests. Meetings against the Act started in February 1919 and continued to build up till April 13. Jallianwala Bagh at the heart of the walled city—a barren piece of land where buffaloes grazed—became a natural venue for these protests. Meetings were held in the Bagh at regular intervals. Dr Satyapal, a Hindu, and Dr Saifuddin Kitchlew, a Kashmiri Muslim, were the faces of the anti-Rowlatt protests in Amritsar. This pluralism in the legacy of the Jallianwala Bagh protests has also been erased from public memory. At a time when India is increasingly polarised, this aspect of the massacre is worth preserving. The arrest of Kitchlew and Satyapal on April 10, 1919 sparked off violence in the city. In the mob frenzy that erupted after the British fired on an unarmed crowd, five white men lost their lives. More than 20 Indians also died in the firings. Marcella Sherwood, an English teacher, was attacked by a mob armed with sticks. For the British, all these brought back memories of 1857. “They were paranoid,” says Yadav. It is in this charged atmosphere that Dyer encountered the crowd in Amritsar. He chose to be the self-appointed protector of Amritsar. Just like Dyer, the whole Punjab administration—under the leadership of O’Dwyer—genuinely believed that there was an impending rebellion. Wagner says that till the shots were fired, the satyagraha activists of Jallianwala Bagh had a firm belief in the “justness” of the government. “They saw themselves engaged in political negotiations till the very end, which was very remarkable,” he says. The Hunter Commission that investigated the massacre found Dyer guilty of an error of judgment and terminated him from service. But, the brutal system that he represented, that held Indians as inferior, continued its reign. In the days following the massacre, the British unleashed unparalleled brutality in Amritsar and in many other parts of India—another fact which is not widely discussed in popular narratives. Indians were expected to get off a cycle if they saw an English. They were made to salaam every English they saw. A whipping post was set up, and Indians were stripped and flogged. This was to collectively punish Amritsar for attacking Sherwood on April 10. Indians who lived in the lane where she was attacked were made to crawl. Following the violence of April 10, the British had a plan to bomb Amritsar, too. Gerard Wathen, who was the principal of Khalsa College, dissuaded the British authorities from doing that. But, aeroplanes did hover above Amritsar. The troops were allowed to “use all force that is necessary”. An official announcement proclaimed that “all gatherings will be fired upon”. Water and electricity supply was cut off. The British claimed it was to quash the rumours doing the round that the water had been poisoned. But, it was a punitive measure. “Amritsar had, in fact, become a concentration camp,” says Kishwar Desai, chairperson of the Partition Museum, Amritsar. Desai and her husband, Lord Meghnad Desai, played a major role in initiating the Jallianwala Bagh debate in the House of Lords. Desai has also put together an exhibition that details the British martial laws during the era. There is an account of Moulvi Gholam Jilani, a local imam, in the archives. Jilani was taken to the police station and beaten until he passed urine. The police wanted him to name Kitchlew, Satyapal and a few others as the ring leaders of the mob violence in Amritsar. It is important that such stories of brutality be remembered—in India and in Britain. Lord Karan Bilimoria, a vocal advocate for a British apology, told THE WEEK that the massacre should be part of the curriculum in Britain; it is high time that the youth of both the countries understood how the empire hid an era of darkness in its Kohinoor brilliance.